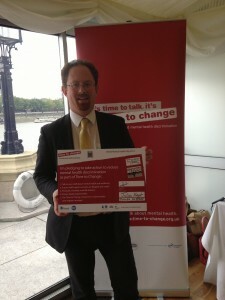 MP Julian Huppert has backed a campaign by the national charity Rethink Mental Illness to make the Government’s fit-for-work test fair for people with mental illness. He also joined Rethink Mental Illness, MIND and Time to Change to celebrate today’s (Thursday, October 10) World Mental Health Day. 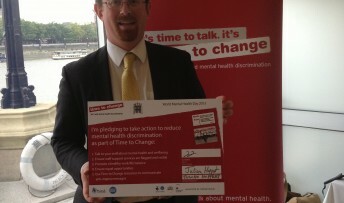 Julian pledged his support for the campaign after being invited to take part in a mock “fit-for-work” test, organised by Rethink Mental Illness to give MPs a deeper insight into the flaws in the Government’s fit-for-work benefits tests. Around 20,000 people are going through the Work Capability Assessment process every week, which was established in 2007 by the last government, despite the fact that in a recent court case (1) three judges found that the tests put people with mental health problems at a ‘substantial disadvantage’. Lara Carmona, Head of Campaigns for Rethink Mental Illness said: “This was obviously a slightly tongue in cheek exercise, but there is a very serious message underpinning it. Just as our MP Capability Assessment doesn’t accurately reflect Julian Huppert’s ability to be an MP, neither does the Work Capability Assessment fairly judge whether someone with mental illness is able to work. Julian said: “This one-size-fits all test leaves people with autism or mental illness seriously disadvantaged. Their needs are complex and should be assessed as such, by people who are expert in this area.